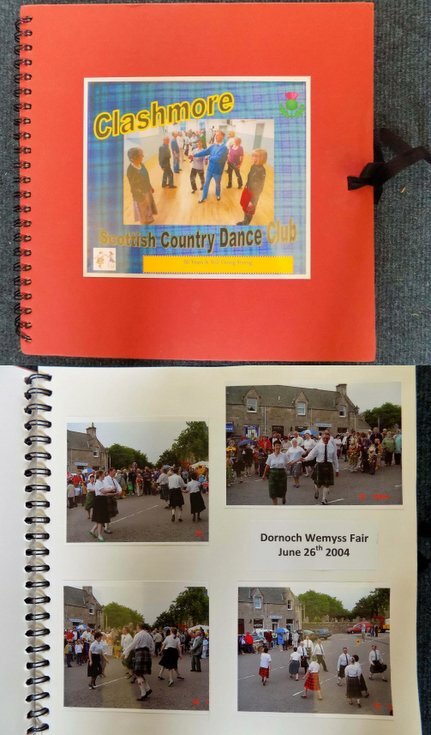 Spiral bound scrapbook, with red card front and back cover, produced to commemorate the 50 year anniversary of the Clashmore Scottish Country Dance Club. The front cover has artwork with a photograph of members dancing, the title of the group, thistle logo at top right, a dancing couple logo at bottom left and an inscription in a yellow panel '50 Years & Still Going Strong'. The inside page provides an historical account of the formation of the club at a meeting at the Carnegie Hall, Clashmore on Wednesday 5th January 1966. A colour photograph of the Carnegie Hall is included in this account. Thereafter the scrapbook contains a listing of Office Bearers 1966-2016 and accounts with colour photographs of Club events.